With an Amlogic S905D Quad Core CPU, powerful GPU, 1GB RAM and 8GB Flash storage, your movies will play smoothly and load faster. Stunning clarity vivid colour and sharp detail will make the best of new generation 10 Bit colour UHD TVs. Full HD 1080p also looks great. Supporting HDR & HDR10+ content. The future of television with brighter whites and darker blacks. The best quality picture. All sound formats from 2 channel stereo to 5.1 Dolby Digital. Also Flac lossless HD audio is supported. Playback content from your network of DLNA devices. Share your tablet or smartphone screen onto your TV for everyone to see (it’s like HDMI only wireless). Android opens a world of limitless possibilities through the Google Play store. Games, video players, APPs, utilities and lots more. Connect USB flash drives, powered hard drives or a Micro SD card. Input devices like a mouse, keyboard or a webcams. Connect to older TV’s via Composite video and L/R stereo (cable not included) or connect to new TVs with HDMI for the ultimate in sound and vision. Wi-Fi and Bluetooth on board means that you can connect to wireless networks or connect wireless products to the media player. Whether it is 4K movies from Netflix, Youtube videos online, movies/music from your home network or USB storage drive, KODI ensures playback on other media player files. The latest in Digital Television to your traditional or new model TV. Program, schedule and timeshift live tv. Watch and record all your favourite shows in crystal clear digital quality. HDR10 is an open standard supported by a wide variety of companies, which includes TV manufacturers such as LG, Samsung, Sharp, Sony, and Vizio, as well as Microsoft and Sony Interactive Entertainment, which support HDR10 on their PlayStation 4 and Xbox One video game console platforms. HDR10+, also known as HDR10 Plus, was announced on April 20, 2017, by Samsung and Amazon Video which updates HDR10 by adding dynamic metadata. HDR10+ video will be offered by Amazon Video later in 2017. Hardware decoding up to 4K which can support the real 4K output. 4K streaming content is compressed in order to be sent across the internet to your TV. Hardware powerful enough to decompress this content is needed to display 4K content on your television. High definition content is streamed using the latest codec's. These require a lower specification media player to process. Our media player will process both these and many more codecs. Kodi™ (formerly known as XBMC™) is an award-winning free and open source (GPL) software media centre for playing videos, music, pictures, games, and more. Kodi runs on Linux, OS X, Windows, iOS, and Android, featuring a 10-foot user interface for use with televisions and remote controls. It allows users to play and view most videos, music, podcasts, and other digital media files from local and network storage media and the internet. Connect to the internet and access all your favourite apps, games and more. You can connect using the Wi-Fi or via the Ethernet/LAN port situated on the back of the player. Follow the menu to internet settings and you can connect there. If you get stuck please follow the instruction manual located in the box or on our website. Supports USB external memory devices such as hard drives or flash drives up to 2TB. Connect an external hard drive or flash drive to one of the USB ports situated on the side of the media player. Playback movies, videos, photos and music directly. Certain older USB hard drives requiring power from the USB port may not be supported (if you have a USB HDD with two USB plugs, then this is ok). Connect various devices, such as a webcam, mouse or gaming joystick to the Android Media Player. If your mouse or keyboard is Bluetooth enabled you can also connect wirelessly. DTS is a series of multichannel audio technologies owned by DTS, Inc. The highest quality surround sound audio compliments the high definition picture creating a submersive audio environment. DTS creates a lifelike cinema experience in your home. It is the gold standard in audio quality. Wirelessly connect with your Bluetooth enabled keyboard & mouse, or joystick for gaming. Optical Audio is pure digital sound that is delivered via light from your Media Player to your TV or sound system. It offers a much higher quality sound than the traditional analogue sound that comes from RCA jacks in older AV and home entertainment equipment. The Amlogic S905D Cortex A53 will hardware decode your latest codecs to ensure smooth playback every time. Software decoding isn’t the best option because it’s not terribly efficient. Building a hardware decoder into a chip allows for more efficient operation, which means better performance on chips with improved efficiency. Cortex A53 designed specifically for Media Players. The Amlogic S905D Cortex A53 has been designed specifically for Media players with DVBT. The Laser MMC-B18 Smart Media Player uses the Amlogic S905D – adding latest video decoding up to 4K. It is the latest chipset to support DVBT and 4K HDR content. 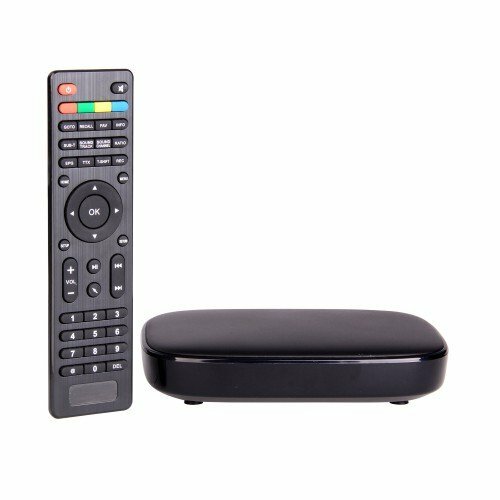 The LASER MMC-B18 set top box is the ultimate TV Set Top Box and Android Media Player in one. Bringing movies, music and more to your TV or Home Theater. Watch HD TV or play content from storage devices via USB or Micro SD Card. Connect to a TV, monitor or projector with HDMI and stream content via network LAN, Wi-Fi or DLNA. The Media Centre outputs Dolby Digital and DTS surround formats as well as playing back practically any file format you can think of. Powered by Googles Android 6.0 OS, you get Netflix, YouTube pre-installed as well as the Google Play store and Kodi media player. Gmail Account (to use Google play store) To access the Google Play Store, you will need to sign up or use your Gmail (or other Google) account. Home theatre system or reciever (to experience surround sound) For a great Home Theatre experience, connect to an AV reciever or 5.1/7.1 surround sound system.